& from Republic of Ireland / Éire including Yaxham. The beautifully crafted edition is strictly limited to 2,500 numbered copies housed in a silk-screened box. Each copy is signed by Ringo Starr. A page of stamps and three postcards housed in a black envelope have been specially made for the book and are included in every copy in the edition. Each copy is unique with a stamp glued onto the title page. This stamp will have been selected from the hundreds of stamps from around the world, specially purchased for this edition. Therefore no two copies of Postcards From The Boys will be the same. There is more handwork involved in the craft bookbinding here than with any previous Genesis book. The two sides of each facsimile postcard are carefully hand fixed so there are 108 individual pieces pasted into every copy! The superb facsimile reproductions of the cards, complete with the occasional drawing, depict both the spontaneous wit and art of The Beatles. The messages sent with love and kindness give insight into the unique bond which existed between the members of the Fab Four. The reproduction of the postcards is supplemented with a revealing and humorous text from Ringo explaining the meaning behind the cards and documenting the corresponding moments of his life. This is quite simply a "must-have' item for anyone interested in the story of The Beatles' phenomenon. A Stunning book and everything & more that you would expect from a Genesis publication! 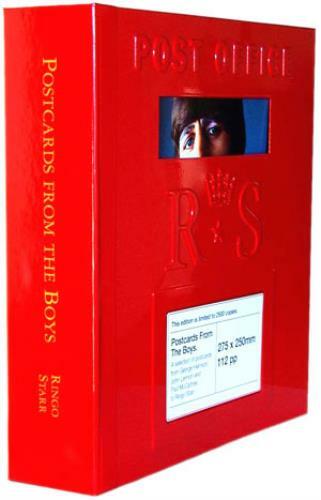 Product Information Ringo Starr Postcards From The Boys UK book.